Forgive me for not being regular last few days. I am visiting Bangladesh after 5 years. So I deserve this break. I am giving Special Naru / Special Coconut laddoo. 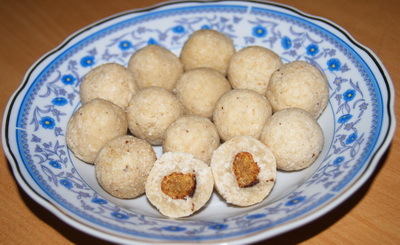 It is Naru stuffed kheer ball inside. You can omit the kheer ball part. Then it will be plain sugar naru. Even you can big naru and put 2-3 kheer balls inside. 1. Fry semolina in ½ teaspoon clarified butter/ ghee and mix with kheer / rabri. 2. Make small balls with it and fry it with clarified butter/ ghee till it becomes golden brown. 3. Heat the pan on medium high and add grated coconut, cardamom and sugar. 5. Remove from heat and let it cool down slightly. Tips: 1. Store in an air tight container or refrigerate it. 2.For making kheer boil 1/2 liter milk with 1 and 1/2 teaspoon rice flour together till it becomes pliable(don’t forget to stir continuously). I like your website, your recipes and I love Bengali language, Bangladesh, its people and everything about Bangladesh. I am nostalgic about Bangladesh, my land of birth ( AAMAR JONMO BHOOMI ).I specially like the Bengali sweets which are a real delicacy of Bangladesh. yeah I agree with you that Bangladeshi sweets are real delicacy. I have sweet tooth so I just love to make and enjoy those. Which part of Bangladesh are you from? As you are on a visit to Bangladesh these days so convey my salam to my JONMO BHOOMI. Thank you very much for your reply. I am a bit late in responding as one of my sisters was on a visit from USA and was staying at my house. She has just left on Friday which was Eid day here in Karachi. My parents had migrated from India to Bangladesh where I was born and we lived at various places of Bangladesh as my father was in a transferable job. I therefore claim that I belong to every part of Bangladesh. The last six years of my stay in Bangladesh was in Dhaka. I think that you are doing a great job by introducing Bengali recipes to the lovers of Bengali recipes. I would request you to send me some of the recipes that I could not find in your site which are as follows. 2. Dhaka Paneer ( cheese ) which used to be sold in those days at Olympia Bakery and Arzoo Bakery on Nawabpur Road wcich were very close to each other as well as Amjadiya Hotel. I hope that you will add the recipes of above mentioned items in your site and oblige. I pray for the improvement and further popularity of your site which is already a great success.